Vigilant Solutions makes sure it has a lot of subject matter expertise in the form of former police officers working for the company. Left to right: Det. David Rivera, NYPD; Lt. Scott Dye, Oregon Department of Public Standards & Training; Lt. Tom Joyce, NYPD; Officer Kevin Schneider, Hackensack, New Jersey; Det. Roger Rodriguez, NYPD. 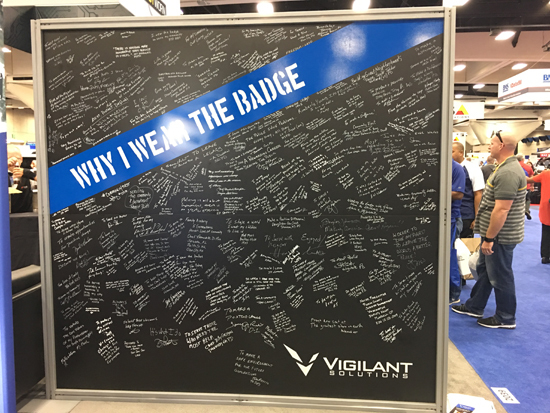 Everyone at Vigilant was involved in the “Why I Wear the Badge” tribute project and could not be prouder. 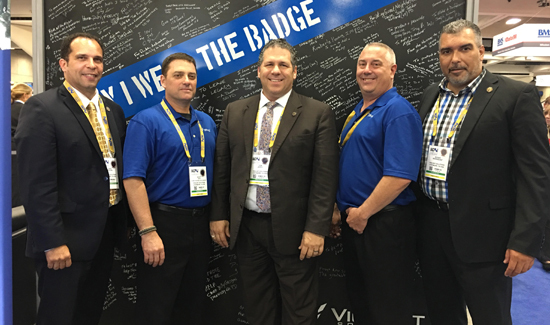 At this year’s IACP Convention in San Diego, participants got a rare chance to show their respect for law enforcement and the sacrifices they make to serve and protect. Someone had a genius idea to put up a blank black board at the Vigilant Solutions booth. Vigilant Solutions creates highly innovative and essential tools for law enforcement—tools that ultimately saves lives. Vigilant Solutions’ Automated License Plate Recognition technology is the most comprehensive offering available, with over tens of thousands of users around the world and thousands of success stories. Vigilant Solutions’ products are designed to collect, organize, and share data to credentialed law enforcement personnel, providing intelligence that is readily accessible and easy to use. One widow left this tribute to her husband on the board. As soon as the empty board went up the Vigilant Solutions people invited passersby to write a note in recognition or memory of a law enforcement person they knew. 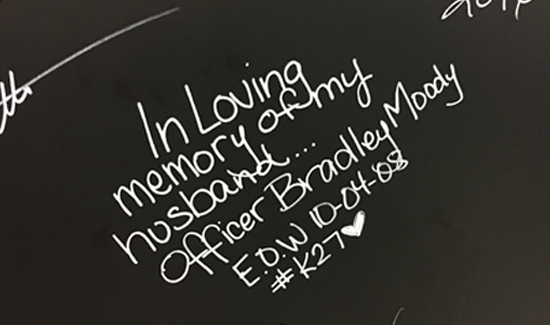 Within 30 minutes, the blackboard was filled with moving, emotional notes, some from people who had lost a spouse or friend in the line of duty. Several officers who signed the board said they were going to put up a similar board in their cities and towns as soon as they had a chance.